This database includes name, age, date of death (where recorded) and date of burial/cremation, and type. This is an updated database from the original which was compiled to February 2004. 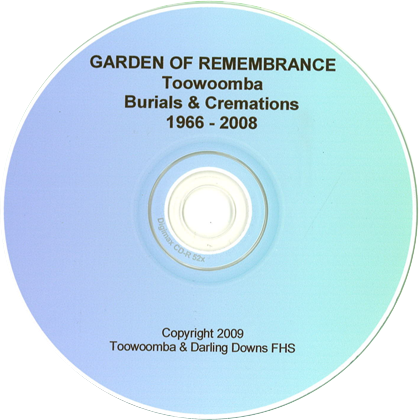 This list contains the names of those buried or cremated at the Toowoomba Garden of Remembrance to September 2008. This initial project would not have been possible without the full co-operation of everyone at the Toowoomba Garden of Remembrance. The index has been compiled in Microsoft Excel, and the CD includes an Excel viewer for those who do not have the programme.